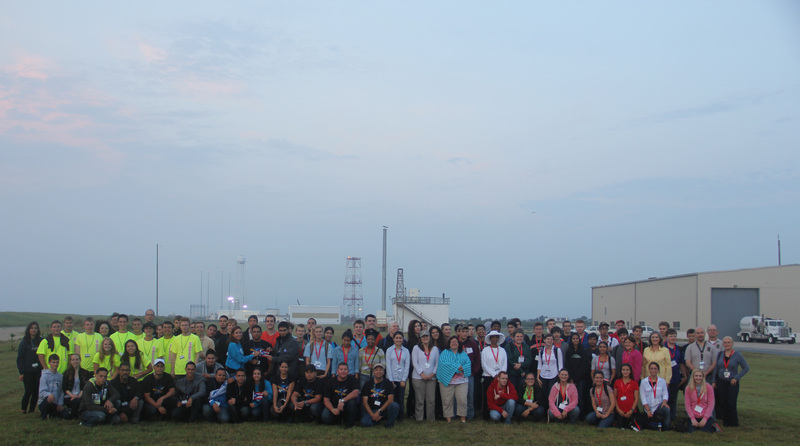 WALLOPS ISLAND, VA – A nearly 900 pound complex payload integrated with dozens of science experiments created by talented university students in a wide range of disciplines and from all across America streaked to space from NASA’s beachside Wallops launch complex in Virginia on August 13 – just before the crack of dawn. 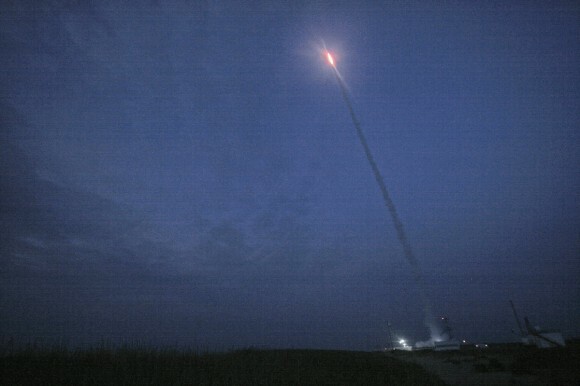 The RockSat-X science payload blasted off atop a Terrier-Improved Malemute suborbital sounding rocket at 6 a.m. from NASA’s Wallops Flight Facility along the Eastern Shore of Virginia. As a research scientist myself it was thrilling to witness the thunderous liftoff standing alongside more than 40 budding aerospace students brimming with enthusiasm for the chance to participate in a real research program that shot to space like a speeding bullet. “It’s a hands on, real world learning experience,” Chris Koehler told Universe Today at the Wallops launch pad. Koehler is Director of the Colorado Space Grant Consortium that manages the RockSat-X program in a joint educational partnership with NASA. The hopes and dreams of everyone was flying along. The students are responsible for conceiving, managing, assembling and testing the experiments, Koehler told me. Professors and industrial partners mentor and guide the students. RockSat-X is the third of three practical STEM educational programs where the students master increasingly difficult skills that ultimately result in a series of sounding rocket launches. “The RockSat program started in 2008. And it’s getting bigger and growing in popularity every year,” Koehler explained. 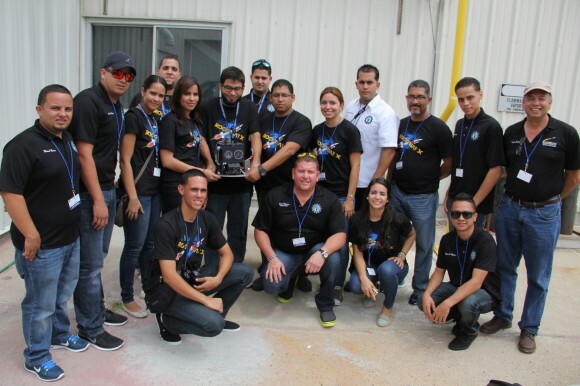 The 2013 RockSat-X launch program included participants from seven universities, including the University of Colorado at Boulder; the University of Puerto Rico at San Juan; the University of Maryland, College Park; Johns Hopkins University, Baltimore, Md. ; West Virginia University, Morgantown; University of Minnesota, Twin Cities; and Northwest Nazarene University, Nampa, Idaho. We all watched as a group and counted down the final 10 seconds to blastoff just a few hundred yards (meters) away from the launch pad – Whooping and hollering as the first stage ignited with a thunderous roar. Then the second stage flash – and more yelling and screams of joy! – - listen to the video. Moments later we saw the first stage plummeting and heard a loud thud as it crashed into the ocean just 10 miles or so offshore. For most of the students -ranging from freshman to seniors – it was their first time seeing a rocket launch. “I’m so excited to be here at NASA Wallops and see my teams experiment reach space!” said Hector, one of a dozen aerospace students who journeyed to Wallops from Puerto Rico. Local Wallops area spectators and tourists told me they could hear the rocket booming from viewing sites more than 10 miles away. Others who ‘overslept’ were awoken by the rocket thunder and houses shaking. Suborbital rockets still make for big bangs! The Puerto Rican students very cool experiment aimed at capturing meteorite particles in space using 6 cubes of aerogel that were extended out from the rocket as it descended back to Earth, said Oscar Resto, Science Instrument specialist and leader of the Puerto Rican team during an interview at the launch complex. Another team of 7 students from Northwest Nazarene University (NNU), Idaho aimed to investigate the durability of the world’s first physically flexible integrated chips. “Our experiment tested the flexibility of integrated circuit chips in the cryogenic environment of space,” Prof Stephen Parke of NNU, Idaho, told Universe Today in an interview at the launch pad. “The chips were mechanically and electrically exercised, or moved, during the flight under the extremely cold conditions in space – of below Minus 50 C – to test whether they would survive,” Parke told me. The 44 foot long, two stage rocket flew on a parabolic arc and a southeasterly trajectory. The 20 foot RockSat-X payload soared to an altitude of approximately 94 miles above the Atlantic Ocean. Telemetry and science data was successfully transmitted and received from the rocket during the flight. The payload then descended back to Earth, deployed a 24 foot wide parachute and splashed down in the Atlantic Ocean some 90 miles offshore from Wallops Flight Facility. Overall the mission lasted about 20 minutes. A commercial fishing boat hauled in the payload and brought it back to Wallops about 7 hours later. 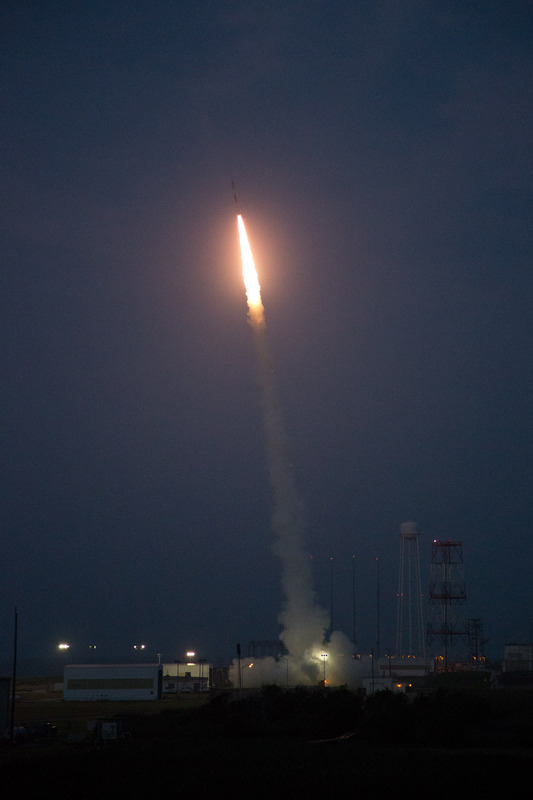 By 2 p.m. the RockSat-X payload was back onsite at the Wallops ‘Rocket Factory’. And I was on-hand as the gleeful students began tearing it apart to disengage their individual experiments to begin a week’s long process of assessing the outcome, analyzing the data and evaluating what worked and what failed. See my photos. Included among the dozens of custom built student experiments were HD cameras, investigations into crystal growth and ferro fluids in microgravity, measuring the electron density in the E region (90-120km), aerogel dust collection on an exposed telescoping arm from the rockets side, effects of radiation damage on various electrical components, determining the durability of flexible electronics in the cryogenic environment of space and creating a despun video of the flight. Indeed we already know that not every experiment worked. But that’s the normal scientific method – ‘Build a little, fly a little’. New students are already applying to the 2014 RockSat program. And some of these students will return next year with thoughtful upgrades and new ideas! The launch was dedicated in memory of another extremely bright young student named Brad Mason, who tragically passed away two weeks ago. Brad was a beloved intern at NASA Wallops this summer and a friend. Brad’s name was inscribed on the side of the rocket. Read about Brad at the NASA Wallops website.